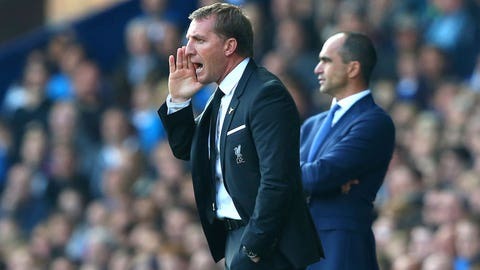 Brendan Rodgers barks out orders during Liverpool's 1-1 draw against Everton at Goodison Park. Liverpool manager Brendan Rodgers insists there is "no drama" at Anfield despite a 1-1 draw in the Merseyside derby doing little to quash the scrutiny he finds himself under. A Danny Ings header in the 41st minute was cancelled out in first-half added time by Romelu Lukaku as Everton went on to dominate the 225th Merseyside derby, keeping themselves ahead of their near-neighbours in the table. New speculation about Rodgers’ future appears to be a daily occurrence but his side are still only three points off fourth place heading into the international break. "There are two points: the first is I don’t feel any pressure, I can honestly say that," he said. "There is pressure to sell newspapers and make stories and I understand and respect that. My job is to worry about the team, that is the only pressure I will feel. "People will want to put pressure on for different reasons. I don’t feel it, I don’t want it but anything externally, there is no drama. "I have never felt anything other than secure. That is not being complacent. I was brought here to do a job, I signed a new deal (in May 2014) and the owners know it takes time." Despite spending almost £300million ($455 million) in just over three years in charge, Rodgers stresses there is plenty of work still to do having seen pivotal players like Luis Suarez and Steven Gerrard leave in recent seasons. And he claims owners Fenway Sports Group have never stipulated he has to regain Champions League football with a top-four finish. "In all my time it has been an internal ambition but it has never been said by the club," he added. "We did that against the odds a couple of years ago (almost winning the title with a Suarez-inspired side). We lost quality and will have to rebuild. 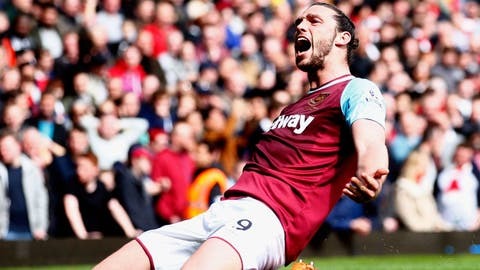 "I have never been asked or told to deliver that (a top-four finish) by anyone at the club since I came in. "If we are to replicate what we did two years ago we will have to build something. That will take time. That is frustrating for supporters but there are new players to come in. "It will take time, whether that is me or someone else. While it is me, I will continue to devote every ounce to the club." Everton manager Roberto Martinez was disappointed not to end a winless run in the derby which stretches back to 2010. Despite dominating the second half they could not find the crucial second goal, although that may have been different had Reds midfielder Lucas Leiva been shown a second yellow card for a foul on Ross Barkley instead of being let off by a lenient Martin Atkinson. "It is one of those games we are not going to agree with the result," Martinez said. "Our performance was good enough to get the three points but you need to earn them and I don’t think we had that bit of luck you need in front of goal. "Simon Mignolet was outstanding and we are disappointed with the goal we conceded but the reaction was pleasing. "In the second half we carried real danger and that little bit of composure would have given us three points." Martinez questioned Atkinson’s reasoning for deciding not to caution Lucas which would have meant he had to send off the midfielder. "I don’t understand that decision. Lucas was very clever. His technical fouls were very clever but the second one was from behind and should have been given a yellow card," Martinez said. "Martin has a clear view. We should have played against 10 men in the last 15 minutes." One of the major positives for Everton was the display from Lukaku, especially once he scored his goal as he gave Liverpool’s defenders a torrid time. "The hold-up play from Rom was the strongest we have had in an Everton shirt," Martinez added. "He locked three centre-halves and we played around him."